Qarm Qart - real name Carmine Cartolano - was born in 1972 in Salerno, Italy. An artist, writer and translator, he has been living in Cairo since 1999 where he also teaches Italian as a foreign language. He considers himself a very proud Cairene. Qart’s artwork has been exhibited in Luxor, Alexandra and Cairo (Egypt), Bologna (Italy), London (UK), Bahrain, and Paris (France). He is also the author of two books written in Egyptian Arabic: ‘Momo’ (Dar Al- ‘Ain, 2017), and ‘Masriyyano: Diaries of an Italian Artist’ (Dar Al-‘Ain, 2012). Ilyes Messaoudi is a visual artist who is training to be a professional graphic designer. He currently lives between Tunisia and France, yet his artistic influence is rooted in his North African heritage. His energetic collages often use contrasting tones with a dash of childish spontaneity, simultaneously critiquing and praising the taboos within Tunisian culture. In Messaoudi’s most recent collection ‘1001 Nights of Scheherazade’, he presents a series of paintings that juxtapose some popular Tunisian quotes with traditional and contemporary Tunisian cultural icons to depict the story of Scheherazade, the legendary storyteller in the collection of the Middle Eastern folklore ‘One Thousand and One Nights’. Considered one of Libya’s pioneering contemporary artists, Matug Aborawi’s prolific work has a language of its own. His imagery explores current global issues of conflict and the story of migration. Conceptual in nature, he uses dramatic and exotic colours and his work reveals unusual shapes, portraits of nameless people and animals, as well as other poetic content. Born in 1967 in Libya, Aborawi graduated from the Faculty of Arts at the University of Tripoli in 1993. He later moved to Spain and completed a PhD from the School of Fine Arts at the University of Granada in 2013. He has been an Arts teacher at various colleges in Libya and Spain. One of his recurring themes is that of travel to distant shores and the spiritual exodus, where people on boats depart and arrive in magical lands only to return in order to make sense of their existence. The dark seas, the deep oceans and other physical terrains effortlessly connect to the state of dreams, sleep and the unconscious expanse, where the imagination, fantasy and myth combine to evoke deep emotions and contemplation. Aborawi's work has been exhibited in many countries, including in Libya, Tunisia, Belgium, Morocco, Spain Venezuela and Austria. Alla Abudabbus is originally a trained civil engineer with a keen passion for graphic design. Working mostly in the field of advertising and marketing as his day-to-day job, he has been the Director of the ‘Alalama’ marketing company in Tripoli and also founding the ‘Bridge Media and PR’ company. He is also a teacher at the Architectural Department at the University of Tripoli. Recently Abudabbus has been experimenting with and producing a local strand of ‘pop’ art that is relevant to the Libyan contemporary cultural scene and contemplating its unique position within the global consumerist world. His colourful pieces reveal an ironic sense of humour and are full of underlying social commentary as well as mocking in jest aspects of the collective identity and state of mind. His digitally manipulated creations feature recognisable Libyan figures with a reference to local tales or stories and mixing them with Western icons to bring about a juxtaposition of the diverse layers that make up the current Libyan persona. His most famous piece ‘Haja Hurryia’ was picked up by the Benetton Foundation in Italy in 2016 to be the cover image for the ‘Libya Imago Mundi’ international art catalogue project that was curated by Noon Arts. Aimen Ajhani is a self-taught Libyan graffiti artist. Born in 1989 and raised up in Libyan, he was originally inspired by the philosophy of the hip-hop counter subculture. He gained popular appeal during the February 2011 Revolution when his dissident street art became the colourful backdrop to many of the rebellious music videos that were then emerging. In many ways, Ajhani represented the voice of the Libyan youth and visually reflecting on their struggles, anxieties and frustrations. During the uprising, his most recognisable works were of the word ‘Libya’ scrawled on the city’s walls and the signature stencils of ‘Fatima’s Hand’ and the ‘Owl’ that had the message of: ‘Hear no evil, see no evil, speak no evil’. Spotted by the Danish organisation ‘Turning Tables’ in 2013, he was invited to Copenhagen, Denmark to participate in an arts festival. Since then, he has been resident there and involved with many street art projects, murals and exhibiting some of his work on canvas too. Always experimenting under the nickname of ‘Elbohly’, he is currently using Arabic calligraphy within his messages in a style known as ‘calligraffiti’. One of his major murals was completed in Ringsted and was a tribute to the young peace Libyan activist Tawfik Ben Saud who was killed for fighting for freedom, civil rights and justice. It was dedicated to all others who continue to fight for positive change in Libya. Ajhani’s art has been displayed as part of several festivals including in Tunisia, Denmark, Holland, Belgium, Germany and the United Kingdom. Nasreen Shaikh Jamal Al Lail belongs to a number of different worlds that have formed the woman she is today. With a background in photography and the use of digital processes, she looks into the issues of identity and the negotiation of personal space as well as in the interactions between contrasting collective cultural memories and how these may pose problems for the individual. Raised between Saudi Arabia and the UK with an Indian mother and Saudi father, she ventures into the questioning of oneself by weaving an ‘otherness’ into her practice and looking into the impact of an ever-changing global society. She is also the Co-founder of Variant Space, an online art collective for Muslim female artists. In her photographic and digitally manipulated artwork that she creates in a series form, Al Lail charts her experience of having to accustom herself to three different cultural identities and challenging any imposed ideas of how she should or should not be. Her choice of colours also reveals the hidden emotional journey attached to the hybridity of the places she has lived in. On one of her projects titled ‘The Rooftop’, Al Lail has commented: “Identity and space are intimately connected; space delineates the scope for identity. This is particularly the case in the context of Saudi Arabia – space necessitates the very ground for a coherent identity. I use the rooftop – open space – as a metaphor for progressive, liberated and open-ended possibility. Takwa Barnosa is the young talented Libyan artist whose work has caused quite a stir. She fuses Arabic calligraphy with different forms of mixed media; and, in much of her work, she utilises powerful newsworthy photos that refer to her home country, by writing over them with word messages to challenge the content of the stories told within. Barnosa doesn’t shy away from the existential passage in which the Libyans find themselves in, addressing the difficult issues pertaining to the current state of political chaos, anarchy and general disorder. In one of her images, for example, she hints at burning petrol and the human cost entangled with its production. In other pieces, she also brings to attention the displacement of the Tawerghas in Libya and refers to the drowning of migrants who are still washing up on the country’s shores. Her choice of the word is always engaging, be it splashed on the digital image or painted on her canvas. Whether she is tackling the dark themes of death, fear and war or looking at peace, love and dreams, she leaves her messages open to interpretation. In her ‘Lost’ piece, for example, she looks at the recent troublingly destruction of the Italian artefacts in Tripoli, with a photo of the Gazelle statue that was demolished by the attempts to deny colonial history. Mohammad Bin Lamin is a self-taught artist working with sculpture, digital art, photography and painting. Well-known and established in Libya, he uses signature paint methods the secret of which he keeps well under wraps. Inspired by his country’s rich cultural and artistic heritage as well as the surreal identities it has had to endure over the millennia, some of his work references as far back as the ancient cave paintings found in the Southern mountains. Bin Lamin’s colours, shapes and forms also draw upon Libya’s unique landscape, especially the Sahara desert, the Mediterranean Sea and the urban and rural fabrics of its towns and cities. One of his most celebrated paint series, for example, was the 'Yellow Beings' where one sees beautiful but deformed creatures stand out and tell the viewer a story of their own. During the February 2011 Revolution, Bin Lamin was unfairly imprisoned for several months at the infamous Abu Salim prison. But undeterred, he began to draw on the walls of his cell and etching faces on silver tin foil. Later he would also create unusual and powerful sculptures made from bullets, shells and other recycled war material. Bin Lamin artwork has been exhibited in Libya, Egypt, Malta, the United States, Tunisia, the United Kingdom and China. The late Hasan Dhaimish was born in 1955 in Benghazi, Libya. He fled his hometown as a 19-year-old and moved to the UK where he lived in exile for many years. Having completed a Master degree in Art, Design and Media at the University of Bradford, he worked as a graphic designer within various practices as well as teaching at his local art college. First renowned for his satirical cartoons that lampooned Gaddafi and his cruel dictatorship, the ‘Alsature’ persona gained him wide international appeal, as he exposed the injustices and corruption of the regime and mocking those in power. After the February 2011 Revolution, he also took up the post of main graphics illustrator at Libya Ahrar TV. Not as well known, Dhaimish’s other artwork was heavily influenced by Jazz music and Libyan history that dates back to before and after World War II. For example, he created a series of digitally manipulated images depicting scenes from Tripoli and Benghazi that were based on old black and white postcards. Showing the cities during that certain age, he explored what Libya was like during and post the Italian occupation as well as visually representing the ‘Golden Era’ of the 1950s and 60s. When Dhaimish took part in ‘The Melting Pots’ exhibition that was curated by Noon Arts and held during July 2015 at the Arab British Centre, the latter type of his artwork was displayed, whilst he also offered this statement: “I wanted to bring the old and faded black and white images back to life and offer them to a contemporary audience. I especially want the new generation of Libyans to appreciate their culture and the past. Khuloud Elzwai studied Classical Music and Piano at the Faculty of Media and Arts at the University of Tripoli, graduating in 1998. Self-taught as an artist, she uses acrylic and oil on canvas. Her paintings are imagined in the abstract and approach strong emotional subjects that hold multi-layered meanings and are open to subjective interpretation. Elzwai's subjects also relay the value of personal memories, deep feelings like sadness, the consequences of sin and the experience of loss and departures. By using different colour schemes and geometric formations, one detects the music and melody in her individual pieces. Her brushstrokes also convey hidden pleasures and passions, as she addresses the psychological aspects of existence. Her artwork has been exhibited in Tripoli, Libya at Dar El-Founoun, Dar El-Faqeh Hassan and at the Tripoli International Gallery in 2012. In 2010, she was also awarded ‘Best Libyan Visual Artist of the Year’ at the Creative Artist Festival in Libya. Born in 1966 the Libyan artist Yousef Fetis graduated from the Faculty of Fine Arts at the University of Tripoli where he later became an Arts teacher from 1997 to 2000. He also held the position of Director at the Art House in Tripoli for five years before he travelled and spent time in France - between 2000 to 2003 - where he researched the subject of the artistic interpretation of the human body. Fetis’s paintings reflect a rich emotional and sensitive side. His images have a tremendous depth and his technique and choice of colours and textures always accentuate that depth. He is an artist in full control of his medium and confident with bold strokes and experimentations to bring out his feelings on canvas. Although some of the subjects of his paintings may be simple, his treatment manages to create works that nourish the human spirit. He is another artist who is very well known and highly respected in terms of the contemporary Libyan arts scene. His work has been widely exhibited in Libya, Switzerland, France and Malta. He is also a member of the International Union of Plastic Art. The Libyan artist Najla Shawket Fitouri received her formal training at the School of Fine Arts at the University of Tripoli. Painting for her is a way of resistance and resilience against the volatile state of her country. The predilection for blues in her palette stems from the omnipresence of the Mediterranean Sea in her life whilst the use of red falls naturally into place against the blues. Fitouri’s paintings explore the state of Libyan women and her work is populated with their figures, whether they come shrouded in the local white outdoor veils or adorned in multi-coloured traditional dresses and jewellery. Always dominating the foreground, these women are shown as dreamers, whimsical and mysterious, whereas the men if they ever appear, are just fugitive shadows and accessories. The political unrest seen in the region has also been a source of inspiration for her, pushing her to reflect on the role of the arts and artists in fighting the negativity and ugliness of war. In some of her pieces, she represents Libya’s cities of Tripoli and Benghazi as women in such striking imagery that puts them in a historical context. With a French-Libyan background, Hadia Gana studied Ceramics and Glass Making at the University of Tripoli and gained a Master’s in Ceramics from the University of Wales. She has taught Art at various levels ranging from primary school to higher education in Libya and has been awarded arts residencies at the Thami Mnyele Foundation in Amsterdam and as part of the Ashkal Alwan programme in Beirut. In 2010 Gana also took part in the redesign of the Libyan Pavilion at the Shanghai Exposition, whilst the February 2011 Revolution saw her actively blog under the heading ‘40 Years of Running on the Same Spot: A Libyan Diary’. Her biggest and most ambitious project to date however is to complete the building of and open the ‘Ali Gana Museum’ in Tripoli, Libya in memory of her father who was also a well respected artist. Within the inner circles, Gana is currently most famed for her installation art that tackles some of Libya’s difficult socio-political realities. Her ‘Zarda’ piece and the ‘Tripoli Pebbles’, for example, function as a form of social criticism yet they also manage to invite the audience to have a playful interaction that encourages further contemplation. Using clay as primary material, she finds it reminiscent of childhood, when sand and water were favoured for games. Hadia also draws a strong parallel between the spiritual facets of clay and human beings, asserting how clay should be respected and treated in the same way. She further believes that as were born from clay, not from fire, that we are ordered to spread peace in the world. Gana has taken part in many exhibitions and projects around the world, including in Libya, France, Malta, the UK and the Netherlands. Her most important project, as mentioned above, is the realisation of the ‘Ali Gana Museum’. The goal of this unique institution will be to provide a much needed workspace for artists and to implement art tuition as well as being a platform for discussions and cultural interaction. The Algerian-Bulgarian Meryem Meg is a multi-disciplinary artist with a specialty in graphic design. Keen on the themes of fertility, birth and the cycles within nature, she draws upon North African and amazigh marks and symbols in her work. Creating optical illusions and movement through her choice of lines, colours and shapes, Meg’s work hints at the empowerment of women and aims to elicit a mystical experience for the viewer. In some of her artwork, Meg challenges the Orientalist lens in relation to the North African female by providing an alternative that is deeper and more complex. Utilising local motifs that are used within textiles, tattoos and ceramics, she demonstrates the systems of knowledge and the ways in which the indigenous communities have structured themselves and told their stories over the eons. The Syrian Dima Nashawi strongly believes that art goes hand in hand with social activism and is a powerful means for peace building and engaging with human rights. Although her art illustrations are visually delicate, feminine and intricate, they carry a very powerful political message as well as hinting at the longing for return to her hometown of Damascus. Nashawi’s life and work journeys have seen her travel from Syria to Jordan, Lebanon and London, where she recently completed an Art and Cultural Management degree at King’s college. With a bachelor’s in Sociology and Fine Arts, she has also worked as an illustrator-animator for magazines and children’s websites as well as undertaking social work with the UNHCR to help refugees. One of her most striking illustration series is the whimsical fairy-tale titled ‘The Mystery of Names in Raindrops’. It is an imaginary story about a little girl who enters a world in which a witch lives in a forest and oddly collects raindrops in a jar that are brought to her by deer in return for lashes she makes out of spider web. Significantly, the names on the raindrops refer to real Syrians who have been struggling against the regime and other radical elements, with some of them having been detained or others who have lost their lives. The Algerian Hania Zaazoua is a designer, visual artist and stylist. A graduate from Fine Arts, she has been working as the Design Director at Bergson & Jung in Algiers for quite some time and has established her own interior design brand called 'Brokk Art'. Zaazoua draws inspiration from personal wanderings - be they real or virtual - and creates work that flirts with the trivial dream world and exploring alternative versions of the society that she lives in. Enjoying the use of paradoxes, she looks at the complex relationship between the cultures of the East and West. Using digitally manipulated images that she presents on soft silk material that is stretched onto circular embroidery frames, her pieces deconstruct and recompose popular and historical cultural icons by manipulating and questioning the tales being told. 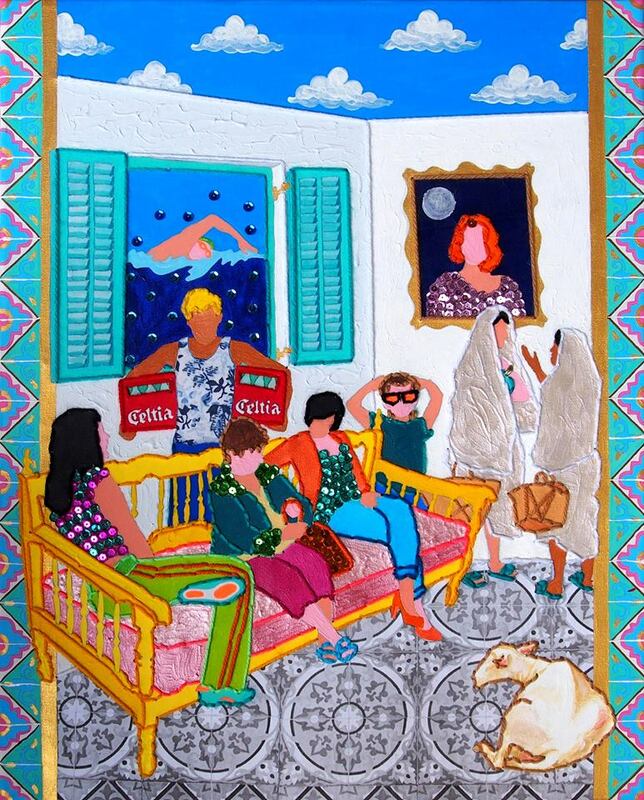 In one of her works titled ‘Young Ladies of Icosium’, she refers to the timeless Algerian women who are renowned for storytelling and wisdom. As leading characters, they present both an interface and interference between the East and West. Set in an undetermined time and space, they allude to the themes of decolonisation and self-empowerment as well as referring to Picasso’s ‘Young Ladies of Avignon’.